Your needs are changing, the world is shifting, and we are here to help. We understand that you need consistency, transparency, and the fast delivery of value. That is what we do. For over 50 years, the W.R. Berkley organization has faced and managed risks for small, medium, and large businesses. Our expertise is delivered by talented independent insurance agents and backed by exemplary service from our claims, underwriting, risk management, audit, sales and marketing teams. We’ll help with risks while you focus on success. Preparing to build a safer, more resilient future. At Berkley Mid-Atlantic Group, we partner with experts who help us build better solutions. We know that adaptability is key in a volatile world – that’s why one of our core competencies is all about agility. Our goal is to stay ahead of the curve so that you are never behind it. Get to know our parent company better. In April 2017, W. R. Berkley Corporation celebrated the 50th anniversary of its founding. Hear our story from some of the people who have contributed to our success. 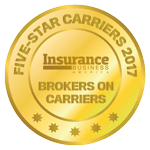 As a Berkley Company, we have been named a Five-Star Carrier on Insurance Business America’s Brokers on Carriers’ report. Berkley earned a five-star ranking in all 10 survey categories ranging from underwriting expertise to claims processing to commitment to broker distribution channel. W. R. Berkley Corporation has been named to the 2017 Ward’s 50® list of top performing property casualty insurance companies. Annually, Ward Group analyzes the financial performance of nearly 3,000 property casualty insurance companies domiciled in the United States. Learn more about Ward’s Top 50® here.